Pizzas, Shakes, Waffles And The Chefs: Brik Oven Is Now Open In Indiranagar! 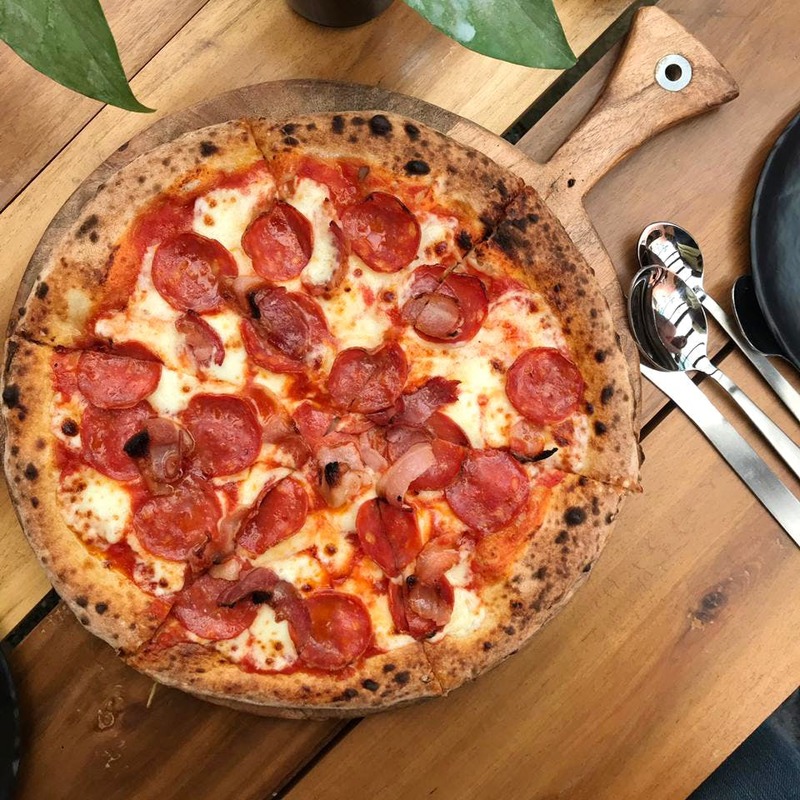 After nearly three years of giving us all infinite joy on Church Street, Brik Oven has now brought their pizza place to Indiranagar. Spread over a large space with green walls, al fresco seating (and plenty at that) and of course, a dominating brick oven (it even rotates; apparently the first in the country), we had a sneak peek at the outlet and we have a strong feeling it's going to be as popular as the first of its name! Choosing to sit in the al fresco area with a retractable roof, it was perfect to soak in the Bangalore breeze but in the protection of the shade. Wooden benches, chairs and tables keep the rustic feel intact, but with chic cuts and design, we like the somewhat upgrade the new place has. The menu however, is as tempting as it was originally! The old favourites like the classic Margarita, Quattro Formagi (loaded with four cheeses) and our all-time champion -- the Streaking Pigs which comes generously topped with cheese, bacon, caramelised onions and tomato sauce. We used to love the dough earlier, but now we love it more! Beautifully fermented over a few days, and freshly made to standardise it, the pizzas have a different flavour with the sour dough base. Ten extra points for that! You can expect a few accompaniments like the Church Street one as well, but not quite yet. That said, we're already dreaming about the cheesy garlic bread! Don't forget their legendary milkshakes (it has to be the Cookie Monster or The Big Bang shake) as well as the divine waffles. Our pick would be the Nutty Professor which is sinfully loaded with Nutella, Ferrero Rocher, chocolate sauce and flakes, and vanilla ice cream. Since there is quite a lot of space we're hoping the waiting time to get a slice of these beauties will be less. But then again with Sreeram Anvesh and Anirudh Nopany behind the counters, the queue for the boys and their brick oven pizzas might just go around the block. But it's worth the wait...well the pizzas are anyway! They're just starting out in the larger format and the trials are still on, so give them a bit of leeway. Let's call it teething phase. But the pizzas are spot on, so maybe this caution is for nothing!